That's three tenths quicker than Rosberg's benchmark. all of the running so far today has taken place on the medium compound tyres. @F1world: Yes, and it will stay that way I imagine. No point wasting a set of option tyres in unrepresentative conditions like this. Raikkonen has gone fastest with a 1:36.973. For those wondering, it seems that Turn 1 moment, and Maldonado's errant monkey seat, jeopardised Hamilton's quick lap so that's why he's currently 13th and six seconds off the pace. @Reno_Richter: That's very generous, he was spinning all over the place in China. Bottas moves into P3, three tenths off Raikkonen's benchmark. What was last year's fastest lap in FP2? Just to compare with this year. Kvyat has only managed tenth but Ricciardo is on a hot lap of his own. Remember this race last year, when he asked Red Bull to move Vettel out of the way. Ricciardo runs wide out of Turn 12, the top of the hill. One of the best websites on the net. Ricciardo can only manage 1:46.964, which leaves him down in 18th, after that moment at the top of the hill. Oh, we have a Red Bull in the gravel, it's Kvyat on the exit of Turn 4, facing the wrong way. Odd place to spin, that. The steering wheel is off and the Russian is climbing out of the car. Since Nate only has two arms, why don't we have a lottery to determine who is the ESPNF1 timing intern of the week? Looks like a driver error, there. Pls, can Bernie make sure we get points for FP's?? Coz Kimi seems to like all FP's but not qualys'..
Yellow flags in sector one, but no red flags. Kvyat is having such rotten luck, i hope it changes soon for him. I'd wager some crosswinds at Turn 4 contributed to that but not a great moment for Kvyat. Is Kvyat earning his keep so far? We now have red flags. The tractor is out to remove Kvyat's car. @Nate , do you think Mercs are sandbagging? ?Nico is abt 4 tenths sower than Kimi on the same tyre. @jee1: Not really. Headline times don't really mean anything in this session. Seems a tractor may be a better option than the Red Bulls at the moment. @Griffo: And by lifting Kvyat's car out of the gravel, it has given Red Bull wings. The session is green again. 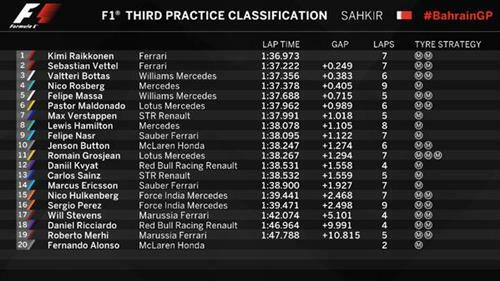 There's 24 minutes left in this session, so that F1 tweet is a little out of date but most of the headline times remain unchanged. JEV is doing really well in Formula E. hes had a few problems, but hes been right there. Lots of sloppy laps out there so far today. I would say none of the top four nailed a perfect lap. Nate, what's holding up Alonso? @Phoenix: No word from McLaren.